Long John Silver’s has an all you can eat special on Sundays and $1.50 fish tacos on Tuesdays. On Sundays, Long John Silver’s has All-You-Can-Eat Fish or Chicken with Sides and Hushpuppies for $7.99 on Sundays. On Tuesdays, Long John Silver’s has Baja Fish Tacos for $1.50. Good every Tuesday now through May 14, 2019. The weekly specials were announced on the Long John Silver’s Home Page and on Facebook. For more deals like this including coupons from McDonald’s, Wendy’s and Burger King, see the EatDrinkDeals Fast Food Coupons page. Long John Silver’s, Inc., is a United States-based fast-food restaurant that specializes in seafood. The name of the brand is borrowed from the novel Treasure Island by Robert Louis Stevenson, in which the pirate “Long John” Silver is one of the main characters. Formerly a division of Yum! Brands, Inc., the company was divested to a group of franchisees in 2011. The restaurant, which has more than 1200 units worldwide, was formerly a division of Yum! 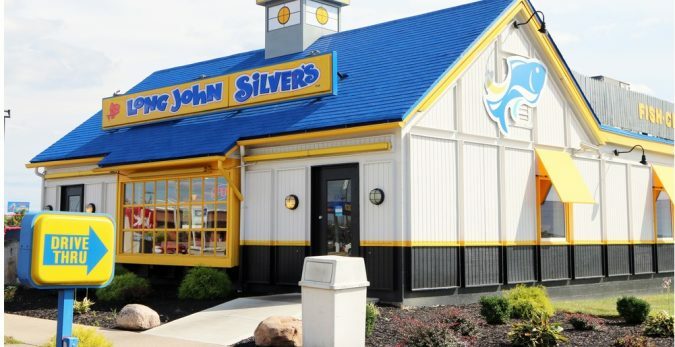 Brands, Inc. Long John Silver’s food offerings include platters, sandwiches, and various single items. The platters feature seafood as the main item, with side dishes consisting of coleslaw, hush puppies, corn, green beans, and French fries (chips) or batter fried onion rings. Seafood items include fish, clams, and shrimp, with chicken fingers known as “Chicken Planks”. More recently, the brand began offering baked cod as a lower-calorie option. The restaurants also sell dessert offerings as separate items.